We do have some queens available right now. Italians and a few Saskatraz. On Friday we will be getting our last shipment of queens for the year. They will be marked Italians and marked Carniolans. Colonies are building up for the upcoming nectar flow. Most package bee colonies should be having a big populations. The next two weeks, package bee colonies will be having many frames of emerging brood increasing the hives population quite a bit. If you are running three deeps and have just put on or close to putting on your third box, the large population of bees will draw out a new box in about 10 days. Make sure there is syrup on the hive so the bees can finish out any undrawn comb. All package bee colonies should have at least two deeps on them right now. Don't get hung up on if the bees haven't drawn out the outside frames in the first box. Put on the second box if you haven't done it already. If you have good populations in both boxes you can remove the entrance reducers. If your package bees are done drawing comb, do a reversal. Bottom box to the top, top box to bottom. No reversals should be done on any colonies after June 10th. The top box may be getting heavy with honey. That is the winter food for the bees. If the top box is very heavy with honey do not do a reversal. Leave the top box the way it is for the rest of the season. Swarming is a concern for all colonies this time of year. All colonies should be checked for swarm cells. Remove swarm cells before they are capped. Check the hive every seven days. Check all the boxes. If you just check the top box for swarm cells you are wasting your time. Swarm cells can be on any frame. Over wintered colonies are bursting with bees. Swarming is going on around the Midwest. Black Locust trees are blooming around the Stillwater area. Hay fields will be blooming now or very soon. Farmers are or will be cutting the first crop of hay in the next week to 10 days. There may be a nectar flow if the hay is not cut right away. The main nectar flow should be starting in about two weeks. Overwintered colonies and any package colonies that are done drawing comb, should have supers on now. All hives are now getting large populations. The main nectar flow is on the horizon. Keep the bees from swarming and you may end up with a nice honey crop. I was out helping a friend do some dividing and requeening. As we were looking through the colonies a mite was spotted on a bee. Looking at more and more of the bees as we were looking for the queen we saw more and more mites. We did see some mites in the drone brood as well when burr comb was broken open between boxes. The colonies were in good shape with good populations of bees. Over wintered colonies are building up in numbers of bees, but so is the mite population. Mite treatments on strong colonies should go on soon. If the are left untreated, viruses may start showing up. Colonies with high mite counts today may not survive until August unless the mites are brought under control. With the nectar flow just around the corner, the mite treatment that should work well at this time is Mite Away Quick Strips (MAQS), the active ingredient is Formic Acid. It is a seven day mite treatment. So the mite treatment will be done before the nectar flow hits. Mite Away Quick Strips can be on during a nectar flow. Package bee colonies new this year can have one MAQS srip on the hive around mid June. Queenless hive with supercedure cells. The queen cells were removed and a new mated queen was added to the split. I purchased a divide from a beekeeper. The beekeeper thought she had moved her queen into the split. I checked it after a couple days and noticed that it was queenless. I was planning on replacing the old queen anyway, but this was a good learning moment. The split had a lot of older larvae and capped brood but no eggs or young brood. The bees started making queen cells. Supercedure cells are an emergency situation for the bees. They will try to make a queen off any viable larvae they can use. For this reason, supercedure queens are not the best for replacement queens. 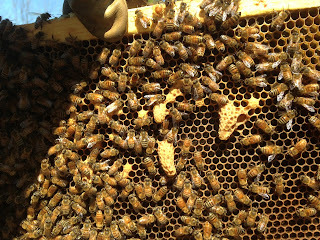 The queen cells are elongated out of the cells and sometimes the room for the new queen to grow properly is not there. This can result in a poorly developed queen. Swarm cell queens on the other hand are produced exclusively to make a queen that will replace the queen that leaves with the swarm. The cell itself is usually a large cell with plenty of room to grow. Swarm cells produce very nice queens. For this reason, a beekeeper should have a five frame nuc or two available for use. A frame of bees that has undeveloped swarm cells on the frame can be moved into a nuc box. This swarm cell will develop in the nuc. The queen will emerge and if she is properly mated, you will have an extra queen on hand. A true free bee. These are supercedure cells or emergency queen cells. They are usually on the side of a frame. Supercedure happens if the queen dies and the bees will scramble to try to make a new queen. Swarm cell. On the bottom of a frame. The current cool and rainy weather has the bees locked in their hives. While they are locked in, the hive is still moving forward. The queen is laying and new bees are emerging. The cool weather will make the overwintered hive feel overcrowded. This will give the hive a reason to make swarm cells. A inspection for swarm cells should be done on a seven to 10 day schedule on strong colonies. Normally when swarm cells are capped, the bees will swarm. Most of the field bees will leave with the old queen. If you look in a hive that has swarmed, you will see no eggs and older larvae and capped brood. You can remove the swarm cells and install a new queen. If you come across a swarm cell that is open on the bottom with no larvae inside, may mean that a virgin queen has emerged. Or if you see these swarm symptoms and you are not sure if they swarmed or you are queenless. This is when having a second hive helps. Take a frame of eggs from the queenrite colony and put it in the queenless colony. Check it after five days. If the bees are making queen cells off the new brood, you could safely say you are queenless and put in a new queen. If the bees are not making queen cells you may have a queen in the hive and she has not started to lay yet. In a hive with a virgin queen, new bees will be getting old enough to forage. The foraging worker bees will bring in nectar and can fill the hive up with honey while the bees are waiting for the queen to start to lay eggs. This can make a hive honey bound, leaving no place for the queen to lay. If this happens, the frames need to be spun out and emptied of the honey and the empty frames given back to the hive. The honey may be too high of a water content to be called Grade A honey, but it can be fed back to the bees. Swarm cells can be anywhere. They are usually on the bottom of the frames. But the bees will put them on burr comb or funky comb. I have seen swarm cells hanging off the top bar. Sometimes the swarm cells are on bridge comb that spans between boxes. When the boxes are broken apart, sometimes the swarm cell is destroyed and the beekeepers never notices that there was a swarm cell there. If one swarm cell is missed it will develop and the bees will swarm. Unsure what swarm cells look like? Go to Google Images, search for swarm cells and you will see over a million pics on what they look like. Saturday 9 am - 1 pm. We have to close early on Saturday. The weather will be lousy on Saturday so we will also be open for two hours on Sunday. The queens have arrived. They got here around 11:30. Black Locust trees usually bloom in late May. They are a great nectar source. Now it is mid May and we have had some nice warm weather over the last week. The warm weather has made it possible for the bees to expand their brood nest. This came at a good time. Package Bees: The 2 lb and 3 lb packages are building up quickly. 2 lb packages should have on their second boxes by now. 3 lb packages should be very close to having a second box. Don't get hung up if the bees have not drawn out the very outside frames in the lower box. Bees are reluctant to draw out the outside frames in a hive because of the temperature differences along the outside edges of the hive. If looking at a single deep and you are unsure if you should add another box or not. If you are thinking, "Wow, there sure are a lot of bees in this box" If that statement crosses your mind then add another box. A frame of drawn comb can be moved down at a later date. If the hive is too crowded they will swarm. Overwintered Hives: Overwintered hives are packed with bees right now. Many of these colonies have put up a super or two of honey already. The crowded colonies should have or should be divided. Swarming is going on and I have heard of quite a few swarms already. This rainy weather will lock the bees in the hive for many days. The bees will feel very crowded and the swarming impulse will be kicking into high gear. This swarming impulse will be in all strong colonies and swarm management should be in place. Checking for swarm cells every 7-10 days is in order. Checking all the boxes for swarm cell and cut out any uncapped swarm cells. Usually if you come across a capped swarm cell the hive would have already swarmed. If the hive has swarmed you should notice a decrease in activity at the front door. There should be a noticeable reduction in bee arrival and departures. There still will be a large population of bees in the hive. But the foragers will be the bees that have left. You normally don't see the foragers in the hive in great numbers during the day because they are out gathering. So an inexperienced beekeeper would say their bees must not have swarmed. If there are capped swarm cells in the hive and the hive has swarmed, it is better to pinch the swarm cell and buy a queen then it is for them to make their own queen. It works best to pinch the swarm cell. Sometimes cutting a capped swarm cell, there could be a queen just hours from being released. If the cell gets opened with out squashing the bee inside, a virgin queen can pop out and jump into the hive. This virgin queen can be very difficult to find. Installing a purchased queen into a hive with a virgin queen, will result in the demise of the queen that was just purchased for $31.00. It is best to purchase a queen, at least from May through the month of June. After the month of June. Purchasing a queen isn't going to influence the outcome of the nectar flow. By the time new bees start emerging the nectar flow will be mostly over. Make sure a queen is available to purchase before the swarm cell is pinched. The fruit bloom: The fruit bloom is coming to an end. Most of the flowering trees and shrubs are done blooming and even the dandelions are on their way out. The bees will now be coming to a time of a dearth in pollen. There may not be large amounts of pollen for about two weeks. Pollen patties should be on hives for the short term. The next nectar flows will be Black Locust in Late May, and alfalfa and the beginnings of the first clover blooms in early June. 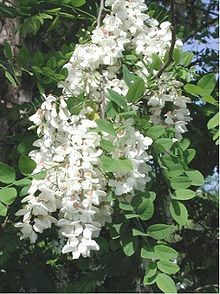 Black Locust can produce a large amount of nectar if there is a large amount of these trees in you locale. Everything is moving in the right direction. The main nectar flow is about a month away. Keep your bees from swarming and this may be a good honey year for all..
Package bees should all be increasing in size by now. 2 lb Packages: The 2 lb packages by now should have their second box on. The 2 lb packages were installed around April 4th. That means new bees started emerging around April 30th. The packages will be increasing in population everyday. 3 lb packages: The 3 lb packages were installed around April 17th. The 3 lb packages should be having emerging brood starting around now. They should be ready for their second box probably next week sometime. 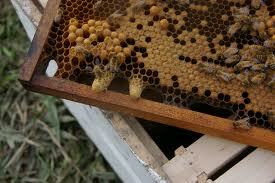 If you are drawing comb on new foundation there should be syrup on the hive constantly until the comb is finished. Pollen patties need to be on package bee colonies until early June. Package bee hives do not have the population to forage for the needs of entire colony until around June 10th. Consider this, a package hive colony installed around April 4th, new bees start emerging around April 30th. The new bees can't even start to forage until about 22 days later. Now that puts us around May 21st. It will still be another couple weeks before there is a large amount of foragers that are old enough and in large enough numbers to provide for the hive. The 3 lb packages are two weeks behind these dates. So for them, their initial time for flying foragers is around May 30th. With good populations of foragers starting around mid June. Cold weather could have impacted some of these dates slightly if the colonies were slowed in their population numbers by not being able to expand their brood nesting area. We are Closed Saturday May 6th through May 9th. We will be getting a new shipment of queens on Wednesday May 10th. I went through a strong overwintered colony last night and cut out over 20 swarm cells. This turn in weather will bring out swarming. After I cut swarm cells I looked for eggs and saw none. There was brood in larvae and capped stages. The queen must have stopped laying and a swarm was going to happen today. I don't think they swarmed because there was a large amount of field bees coming and going. So to totally stop a possible swarm, I switched the location of the hive with a weaker colony. Moved strong hive to weak hive location and weak hive to strong hive location. The field bees fly out and go back to where they think they live. Now the strong hive has lost most of their field bees and the weak hives gets a huge increase in field bees, and I think the swarm has been averted. I will check the strong hive again in five days to see if the queen has started to lay again. Look today for swarm cells in strong overwintered colonies or your bees will be up in a tree. Nature's Nectar LLC will be closed on Saturday May 6th. We will be open longer hours to sell queens and supplies for the upcoming weekend. The cold weather has really thrown a wrench into hive expansion. The bees are doing OK, but the cold has the bees unable to spread out like we would like. The warm weather is coming and things will be back on track soon. The 2 lb packages will be hatching new brood starting sometime this week. Their hives will be showing an increase in bees. Beekeepers who had all drawn comb may be adding a second box in a week or so. Beekeepers drawing foundation on the 2 lb packages are still expanding their comb in the hive. A second box is on the horizon for you. When the bees have drawn out eight of the 10 frames it will be time to add another box. Don't wait for them to draw out the very outside frames, the bees almost never do those frames. I usually will move them in one frame from the outside so the bees will work on them. Over wintered colonies are still moving forward. There are so many bees in these colonies that the cold does not stop them from getting bigger. While the cold has stopped the bees from foraging and has held back the swarming, the upcoming warming trend may change all that. Swarm prevention protocol should be in force with the rising temperatures. Check the colonies for swarm cells on a seven day cycle. Cut the cells before they are capped. If you find capped swarm cells, your hive has probably swarmed. Divides are happening now and for the next three weeks or so. Put honey supers on overwintered colonies now. This warm weather will definitely get the nectar coming into the hives. Mite checks should be done on overwintered colonies to see what the mite load is. Some beekeepers have been treating for mites already this season.